As we are getting closer to the implementation of changes to the Common Rule we would like to begin communicating these changes to the research community. One major change is to the informed consent form. The new requirement is to include “key information” and that the “key information” must appear at the beginning of the informed consent form. The rationale behind this change is that the inclusion of “key information” will help the potential participant better understand the research. Additionally, investigators need to present the information in the informed consent form in enough detail and in a way that a prospective participant can comprehend the information. The Office of Research Compliance is reformatting the consent template to include this “key information”. The template will be available by December in the IRBNet Forms and Templates Library. All applications submitted after December 21, 2018 will require the use of the new template which includes a “key information” section as well as other required changes. -The information obtained is recorded by the investigator in such a manner that the identity of the human subjects can readily be ascertained, directly or through identifiers linked to the subjects. -For these types of studies, the IRB would conduct a “limited IRB review” to determine that there are adequate provisions to protect the privacy of subjects and to maintain the confidentiality of the data. -Identity of subject cannot readily be ascertained. -A disclosure of subject responses outside the research would not place the subject at risk. In this type of research, and the identity of subjects cannot readily be ascertained. -The information obtained is recorded in such a manner that the identity of the human subjects can readily be ascertained, directly or through identifiers linked to the subjects. nature or purposes of the research. **A benign behavioral intervention is an intervention that is brief in duration, harmless, painless, not physically invasive, not likely to have a significant adverse lasting impact on the subjects, and the investigator has no reason to think the subjects will find the interventions offensive or embarrassing. Provided all such criteria are met, examples of such benign behavioral interventions would include having the subject play an online game, having the subject solve puzzles under various noise conditions, or having the subject decide how to allocate a nominal amount of received cash between themselves and someone else. See the federal register here: https://www.hhs.gov/ohrp/interim-final-rule-common-rule.html, and note: “Federal departments and agencies listed in the Interim Final Rule are also in the process of developing a notice of proposed rulemaking (NPRM) seeking public comment on a proposal for further delay in the required implementation of the revised Common Rule (for example, until January 21, 2019).” We will continue to monitor the situation, while concurrently working toward an easy transition for implementation of the new rule requirements when compliance with the final rule becomes required. As we have been advising you for some time now, this sIRB Policy affects multi-site studies involving non-exempt human subjects research funded by NIH, and applies to grant applications with due dates on or after January 25, 2018 and R&D contracts in response to solicitations issued on or after January 25, 2018. A new Special Topics Section to our updated Standard Operating Procedures (SOPs) has been added that addresses the process for IRB Reliances and NIH sIRB here at SBU. If you have any questions about relying on an external IRB, or about having SBU be the IRB of record, for multi-site studies, please contact Ms. Lu-Ann Kozlowski in this office: lu-ann.kozlowski@stonybrook.edu, 631-632-9036. Our HRPP Standard Operating Procedures have been Updated! For the past year, we have been preparing for our second re-accreditation with the Association for the Accreditation of Human Research Protection Programs (AAHRPP), and as a result, our SOPs have been extensively reviewed and updated. We have posted them at this time as a single pdf here: Human Subjects Standard Operating Procedures but will create a more user-friendly format to allow for easy navigating in the near future. Please refer to these SOPs often to ensure the compliant conduct of your research activities. 2. Revisions to reflect the (impending) move from IRBNet to Click as our IRB electronic management system. 4. Section 3.8.2.1 (‘Recruitment of Subjects’) identifies that SBU participates in ResearchMatch (see new section 17.13) and confirms that, when recruiting patients as potential subjects, first contact must be made by someone who has a relationship (e.g., treatment etc.) with the patient; This policy protects the patient’s right to privacy. 5. Section 5.2 (‘Definitions’ within the ‘Obtaining Informed Consent’ section) provides greater detail, per the NYS Family Health Care Decisions Act, regarding the definition of a legally authorized representative who can give permission as a surrogate (in instances where an adult cannot consent for themselves). 6. Section 5.7 (‘Documentation of Informed Consent’) adds that, when using the short form procedure: In addition to receiving a copy of the (English) summary and a copy of the short form at the time of consenting, the subject must receive a copy of the summary, translated into their native language, as soon as possible after their enrollment into the study. 8. Section 14 (Conflicts of Interest in Research) was revised to reflect the new annual disclosure process utilizing the electronic myResearch program. 9. Section 17.4 (‘Registration of Clinical Trials’) clarifies which research activities are subject to the clinicaltrials.gov registration requirement. When the Advanced Energy Research and Technology Center (AERTC), a New York State-designated Center of Excellence, was founded several years ago at Stony Brook University, its goal was to foster collaboration between the brightest minds in academia and industry leaders in energy. Launching the Institute of Gas Innovation and Technology are, from left, Devinder Mahajan, PhD; Stony Brook University President Samuel L. Stanley Jr.; SUNY Chancellor Kristina M. Johnson: Ken Daly, President of National Grid New York; and Robert Catell, Chairman of the Advanced Energy Center. Its interdisciplinary research program and state-of-the-art laboratories have since kept the University at the leading edge of discovery, resulting in new technologies that impact residential and commercial energy use worldwide. Stony Brook recently took another step in its commitment to a future that protects the environment with efficient, sustainable energy management. The University announced on Friday, Feb. 16, the formation of a new Institute of Gas Innovation and Technology (I-GIT), a consortium of industry and academic leaders focused on the development of new energy technologies designed to promote sustainability and save the environment. University President Samuel L. Stanley Jr. joined State University of New York Chancellor Kristina M. Johnson, other University leaders, and representatives from National Grid New York for a ribbon-cutting ceremony Feb.16 at the Institute’s new offices, at AERTC in Stony Brook’s Research and Development Park. 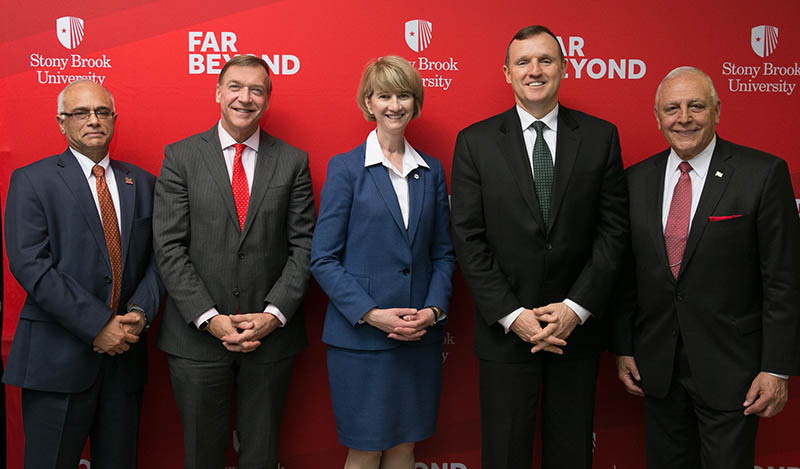 The ceremony marks Chancellor Johnson’s first visit to Stony Brook following her appointment in September 2017. Devinder Mahajan, PhD, a professor of chemical engineering, graduate program director in the Materials Science and Chemical Engineering Department, and expert and accomplished researcher in advanced clean energy technologies, with will serve as Director of the Institute. During the ribbon-cutting ceremony, President Stanley thanked Chancellor Johnson for her continued support. The University has partnered with National Grid, one of the largest investor-owned energy companies in the world, to launch I-GIT. National Grid serves communities in Massachusetts, New York, Rhode Island and the United Kingdom, and it boasts robust policies and programs focused on environmental protection. Sustainability plays a key role in the company’s values and decision making. National Grid is sponsoring a research project to be developed by the consortium that includes a review of energy usage data. The data will be used to identify new methods to improve gas energy efficiency and safety. I-GIT is focused on finding clean, affordable energy solutions to meet the nation’s growing energy demands and challenges. It will also serve as an independent source of information and analysis on gas technology and related policies, and support advanced concepts in gas technology development and deployment for homes and businesses. The Institute is overseen by an advisory board of University researchers and leaders from founding organizations, including National Grid. Devinder Mahajan, a professor of chemical engineering and graduate program director in the Materials Science and Chemical Engineering Department in Stony Brook’s College of Engineering and Applied Sciences, and an expert in natural gas technology, will serve as director of the Institute. The formation of I-GIT comes on the heels of SUNY’s participation in the newly formed University Climate Change Coalition (UC3), announced Feb. 6 during a higher education summit on climate change, at which President Stanley was a featured speaker representing the SUNY system. Stony Brook University represents the 64 institutions of SUNY in the UC3, which comprises 13 leading research universities in the U.S., Canada and Mexico. The goal of the coalition is to aid local communities in the transition to a low-carbon, eco-friendly lifestyle. To achieve this, each participating institution will hold a climate change forum, and the findings from each will be compiled to create a cohesive, international plan of action. The member institutions have already committed to lessening the carbon footprint of their campuses. These initiatives are a continuation of the sustainability efforts already taking place at Stony Brook. The University is in the process of improving its energy efficiency performance by 20 percent and reducing its greenhouse gas emissions by 30 percent. Over the past three years, the University has replaced all of its oil-fired boilers with more efficient gas-fired units not only to improve efficiency but also to reduce hazardous air pollutants. Stony Brook is also working toward sub-metering all of the buildings on campus, allowing for more precise energy use data. Similarly, I-GIT plans to focus on more advanced, safer methods of gas metering. In addition, Stony Brook is a major sponsor participant in the 10th Advanced Energy Conference being held March 26–28 in Manhattan. This year’s theme, “The Future of Energy is Here,” will celebrate the ways that research and development in renewables, batteries and other technologies have become a vibrant part of our economy. Stony Brook’s ongoing sustainability research, coupled with the achievements of AERTC, make the University a natural fit for the Institute, President Stanley said. · CoCs are issued automatically when research is conducted or supported by NIH and falls within the scope of the NIH policy. d. Made for the purposes of other scientific research that is in compliance with applicable Federal regulations governing the protection of human subjects in research. ​Yes, it's true. ​We are going to need some guidance from NIH on a lot of what I just told you, and we will keep you informed accordingly. Here's the notice of changes from NIH: https://grants.nih.gov/grants/guide/notice-files/NOT-OD-17-109.html​. Thanks for asking. Our Step 1 application has been submitted and is being reviewed. Once tweaks are made, and our Step 2 is in, I will send you some of the more significant changes to our SOPs that you will need to know about, as well as more on our move from IRBNet to myResearch (Click).